Brunch has officially been re-invented. Pancakes, French toast and fried eggs have somehow magically transformed to elaborate dishes consisting of some of the most exquisite, and might I say expensive, ingredients. One such lover of re-inventing brunch is none other than Montreal based Chef Antony Nassif. I have been following this young Chef on Instagram and Facebook for a while and he consistently surprises me with his insanely creative dishes that he posts so often. The other day while glancing on Facebook, I noticed he was doing a brunch special at Suwu and I knew I had to have it. My friend and I arrived on a busy Saturday morning and chose to sit at the bar to watch the action in the kitchen, plus the place was so crowded, we thought the bar would be the best option. As we sat down, menus were quickly provided and the friendly bartender made us feel welcome instantly. He let us know the specials of the day which immediately caused me some heartache; how was I supposed to choose between a slow braised breakfast lamb shawarma and a smoked brisket hash with foie gras and truffle? We ordered the doughnuts to start while I contemplated what I was going to eat. My friend knew she wanted the All-dressed MTL bagel and that definitely didn’t help my situation. At the last moment I went for it and decided to order both dishes – Food coma here I come! The doughnut arrived quite quickly and was stuffed with a delicious house made berry jam (I thought it was raspberry but not 100% sure), creamy peanut butter and topped with a deliciously sweet glaze and coloured sprinkles. 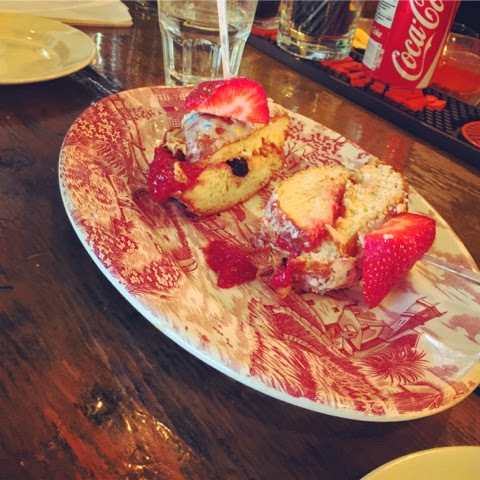 Cut in half and skewered with a strawberry on top, this doughnut was divine. The doughnut itself was just perfect. Soft, chewy and creamy with the perfect glaze and crunch from the sprinkles made me really love this doughnut. The ratio of peanut butter to jam was just perfect; not too sweet nor was the jam overpowered by the peanut butter – heaven! After we devoured the dessert, it was time for the real food and a second cup of coffee. First my shawarma arrived casual style and I dug right in. The first bite blew my mind. I guess Chef Antony really knows what he’s doing because I have never had a more flavourful shawarma in my life. 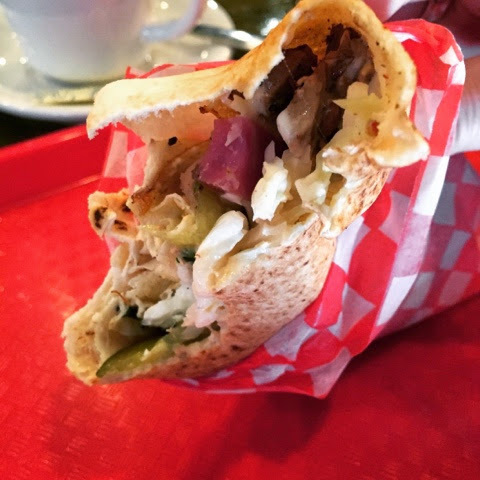 The crispy slaw, the crunchy pickled turnips and a fried egg, all pulled together to elevate this shawarma to a whole new level. From the tender lamb to the rich not overpowering garlic sauce, I now see why this shawarma made its way onto Suwu’s dinner menu – minus the fried egg of course. Then out of nowhere, the largest breakfast dish I have ever seen appeared in front of me. Terrified that I was going to pass out from all the food, I slowly put down the shawarma and reached for my fork. As I took the first bite from the gigantic cast iron pan, I started to feel weak at the knees. This breakfast hash was in a class of its own. The truffle, grand des champs cheese and foie gras incorporated with eggs, breakfast potatoes and brisket made this dish truly special. Each bite incorporated flavours from each element of the dish creating little bites of pure deliciousness. My only problem with this dish was how big it was, but that worked to my benefit as I took the leftovers home and it re-heated perfectly – Amazing! We sat at the bar sipping our coffees and digesting the feast we had just devoured. The bartender kept us entertained and we really had a great time chatting with him. Sitting at the bar was the best idea ever, not only did we have a clear view of the madness going on in the kitchen, but the bartender let us taste his creations and the service was pretty damn good too. 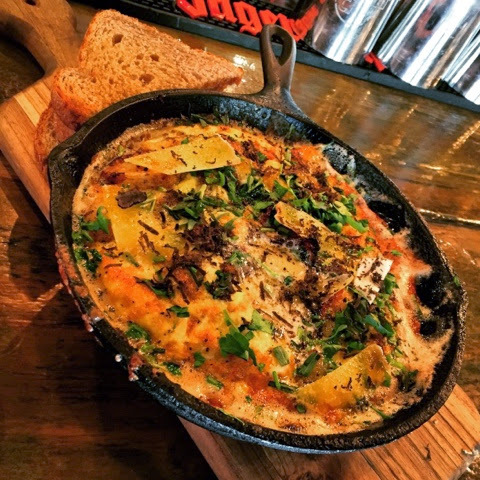 This brunch is really going to be hard to top, can’t wait to see what Chef Antony will come up with next!